The first time I cooked with tapioca pearls a few years ago, I ended up with a giant mess. I was trying to recreate boba tea, and I overcooked the small, translucent spheres and the whole thing dissolved into a gelatinous blob that adhered itself to the pot. After that experience, I stayed away from tapioca pearls – until now. 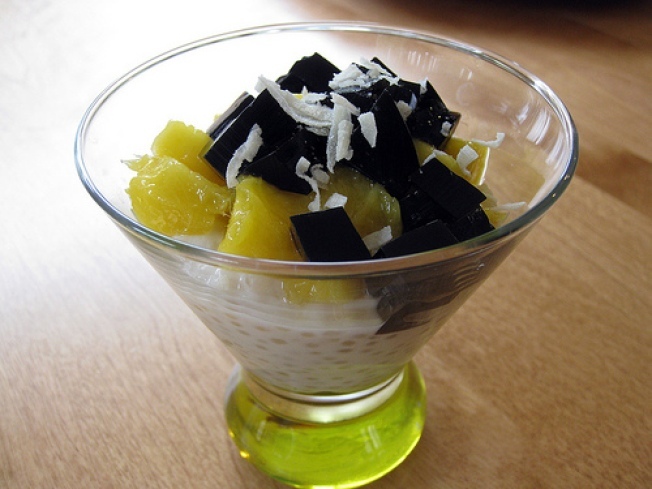 When I came across this recipe for a cool, tropical tapioca pudding first published in Sunset Magazine, and by the Bay Area’s very own Tim Luym, no less, I knew I had to give tapioca a second chance. Luym is the former executive chef of Poleng Lounge, a fun, street-food centered Filipino restaurant that’s no longer around, but I’d met Luym at an Anthony Bourdain book release a few years ago and his super friendly vibe and his amazing use of Southeast Asian flavors made an impression on me. But I digress. Back to the tapioca. Thankfully, this dish turned out to be really easy to make. Just keep an eye on the tapioca pearls as they boil and take care not to overcook them. Use small, white pearls, not the larger, dark ones that you typically see in boba tea. I topped this pudding with toasted coconut, mango, and grass jelly, but lychees, kiwi, or pineapple will work just as well. 1. In a saucepan, cook tapioca in 2 quarts boiling water until only slightly chewy to the bite, 5 to 8 minutes. Pour through a fine strainer. 2. Meanwhile, in another saucepan over medium heat, warm the coconut milk, milk, sugar, and vanilla, until steaming, 6 to 8 minutes. 3. Stir drained tapioca into vanilla mixture. Cook, stirring often, until tapioca pearls are clear and just tender, 3 to 6 minutes. 4. Let pudding cool, then chill, stirring occasionally, at least 1 1/4 hours. Stir in more milk if pudding seems too thick. 5. Spoon pudding into glasses or small bowls. Top with toasted coconut and fresh fruit.